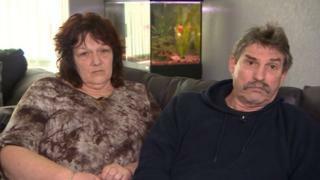 The parents of a woman who died after overdosing on prescription medicine pregabalin say the decision to make it a class C drug could save lives. Chris and Viv Jolly's daughter, Sarah, died after taking the drug, which was prescribed to relieve her back pain. The reclassification of pregabalin as a class C drug was announced in October after a spike in deaths. Mrs Jolly said: "It is [too late] for our daughter, but hopefully it will help someone else." Pregabalin is prescribed to treat epilepsy but is also used to relieve chronic pain. Ms Jolly, a recovering alcoholic who was living in supported accommodation, was taking it along with the drug haloperidol for lower back pain. An inquest into the mother-of-three's death found she had six times the prescribed dose of pregabalin in her system when she died last year. Mrs Jolly, from Scarborough, said: "We were really shocked that a prescribed medication could kill someone. "At the end of the day you do not think your GP is going to give you something that could potentially cause an addiction and, once you are addicted, could potentially cause your death." She added: "Hopefully with the reclassification of the drug families will never have to go through this again." The change in law, brought in on the advice of the Advisory Council on the Misuse of Drugs, means it is now illegal to possess pregabalin and gabapentin without a prescription, and it will be illegal to supply or sell the drugs to others. The latest available figures show that between 2013 and 2017 there were 572 deaths linked to the highly addictive drugs, rising from 32 in 2013 to 127 in 2017. Data analysed by the BBC also shows that prescribing rates for pregabalin and gabapentin have risen by 72% in England in the past five years. In 2014, just over eight million items were prescribed while in 2018 this had risen to more than 14 million. Pregabalin and gabapentin are the first prescription medicines to be reclassified since tramadol was made a class C drug in 2014, also as a result of spike in the number of deaths. Research by academics at the University of York into the impact of that change found fatalities due to the substance dropped. However, Ian Hamilton, associate professor of addiction, warned it was possible a new drug could come forward to fill the gap. "What we found was that the deaths did decrease, so that's really good news," he said. "However, what we think has probably happened is as the prescriptions for tramadol have fallen, at the same time, the number of prescriptions and deaths for gabapentin have gone up. "One drug problem has been replaced with another." Aside from addressing prescription and death rates, drug workers believe the reclassification will result in increased awareness of the drug's addictiveness. Dr Mark Hallam, clinical director of alcohol and drug service Forward Leeds, said making pregabalin and gabapentin class C drugs may lead to people questioning the medicines they are prescribed. He said a combination of fewer prescriptions and heightened awareness could also reduce the amount of the drugs available on the street and dark web. "I think people will be more careful with prescribing it and I think patients may be more careful about asking for it," he said. "I think there will be a distinct patient group who recognise that its addictive and may ask if there's an alternative." The average rise in prescriptions of gabapentin across England is 61%, with the largest spikes in Hastings & Rother (132%), Haringey (113%) and Barking and Dagenham (111%). Prescriptions for pregabalin increased 86%, with the highest increases in Buckinghamshire 203%), Milton Keynes (175%) and Blackburn with Darwen (150%).